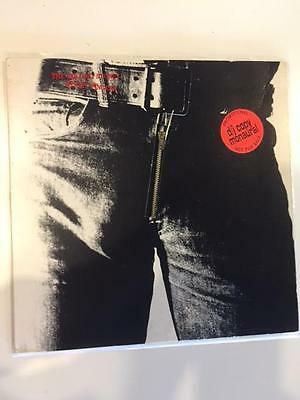 ROLLING STONES Sticky Fingers LP DJ MONO White Label Promo very rare! SLEEVE CONDITION: VG+/EX- Cover rates conservatively at VG+/EX-. Top right corner has a bit of a crease and bottom left front has the same. Both are flat, someone straightened them nicely. Minor corner dings, very minor seam wear at the bottom center and just above the belt buckle. There's a tiny bit of sticky residue at the bottom right front corner. Back cover has the indentation of the zipper and pull that was likely in the box behind it. I'm being highly critical of this condition and still rating it at VG+/EX- but you'll likely find it higher quality. VINYL CONDITION: VG+/EX- Vinyl also rates at VG+/EX- or higher. High gloss with a handful of paper scuffs on both sides. None of this was audible up listening. Labels are M/NM. NOTES: Stunning copy of this holy grale of Rolling Stones vinyl. This was cherished by the previous owner and will make the next owner equally pleased. Has both the DJ Mono Hype sticker as well as the Lips tracklisting sticker on the back. Shipping will be $4 media rate in the US (we'll pay for the Priority upgrade). Outside the US - shipping is NOT $12 for Canada or $19 for rest of the world Air Mail Priority. Please wait for our invoice with exact shipping for Priority mail to your address with full insurance. No buyers from Italy please. We only use sturdy LP and 7" mailers and CD bubble envelopes, made specifically for your item. Paypal or credit cards accepted, in the US, PAYPAL ONLY OVERSEAS. No exceptions, sorry. We combine shipping, in the US or Canada add $1 for each additional CD or 7" and $1.50 for each additional LP. Elsewhere add $3 for each additional CD or 7" and $5 for each additional LP. No refunds will be given to overseas bidders. If you win it, we'll send it out that day if payment is received by 1pm, if not then your item will be sent the next business day.